The bounty of rich hydrocarbons that lies deep beneath the ocean floor holds great promise for an industry that is continually searching for new production frontiers. But tapping that prize brings a host of challenges and obstacles, not the least of which lies in an element that can trigger a multimillion dollar failure if it is not handled properly: sand. Nowhere is this more evident than the Gulf of Mexico, with its high-pressure conditions, long intervals, unprecedented well depths and unconsolidated sands. 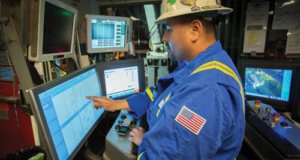 Controlling sand production is a key completion challenge that Mr Rivas and Chevron have faced in the GOM’s Tahiti Field, where wells are producing at 26,000 ft and 20,000-psi bottomhole pressure. In the Gulf of Mexico, frac packs have delivered reliable and efficient completions with little pressure drop across the completion. 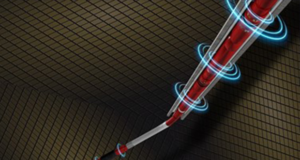 They also have a low skin value, risking little damage to the wellbore. Above, a frac head that connects the surface treating lines to the workstring. “Whether to engage sand-control measures has been probably the single biggest completion design decision,” he said. 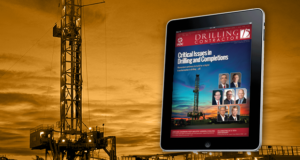 Sand control is currently considered the default solution for deepwater production wells. 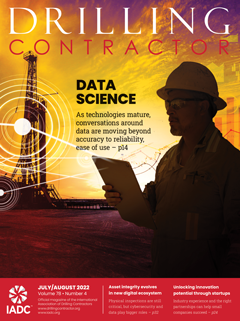 Making that decision requires balancing the cost of implementing sand-control measures with the overall economic viability of the well. “Completions must be cost-effective, reliable for the long term and optimize the production stream from the well,” Mr Rivas said. The process is difficult because operators don’t have a lot of history in deepwater, so not much reliable well data are available. Several factors determine whether sand-control measures should be engaged, he explained. Characteristics of the rock are generally the first order of business and involve cutting, then testing, core samples from the well itself. “Sometimes we’ll do hollow cylinder tests to try and mimic what is happening downhole while producing a well, and see whether the sand is going to crumble, come apart, fill the wellbore and cause a failure of the completion,” he said. 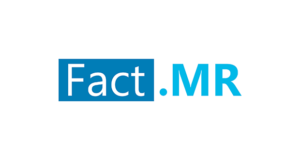 Other factors include the length of time the well will be producing, the degree of drawdown, effects of production on the formation pressure and whether the formation has strong aquifer support such that the pressure won’t decline. “If I exceed the safe drawdown pressure (SDP) on the well, if I pull the well harder than, for example, 1,500 psi, I will probably need sand control,” Mr Rivas noted. “If I stay below 1,500 psi drawdown, or within the limits of the calculated SDP, I don’t need to install sand control. Or, if reservoir pressure drops below a certain value, which affects SDP, I need sand control at that time. I’m probably not going to pull the well apart and install sand control at that point. I’ll install sand control upfront during the initial completion, which is a much more cost-effective approach. 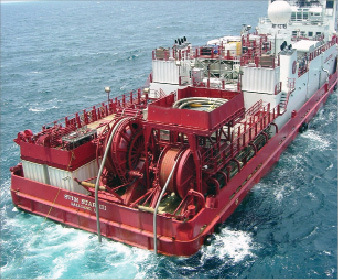 Halliburton’s Stim Star III frac boat was used to pump frac pack treatments on Chevron’s wells in the GOM. 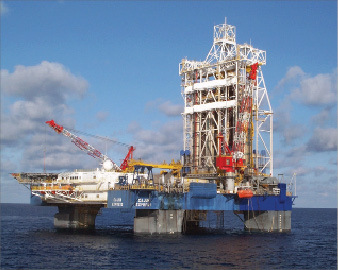 The DP vessel can maintain its position independent of the rig via sonar and satellite. 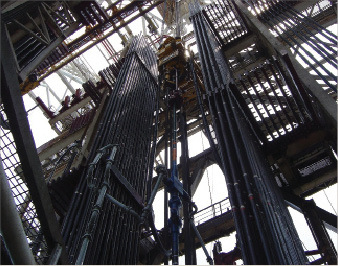 The coflex hoses on the back of the boat unreel from the vessel and are attached to the rig to pump the frac treatment from the boat down the well. Further complicating the sand-control dilemma is the notion that sand can be managed rather than controlled, an idea that appeals to some in the industry who believe that managing versus controlling sand can reduce the completion’s complexity and cost. That approach has been used in the North Sea, but formations there behave differently from those in the GOM. 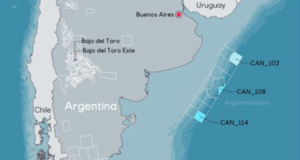 “The North Sea wells in which sand management has been successful can be operated in such a manner that when they start producing too much sand, the operators can choke them back and reduce the amount of sand produced and still have a competent well that is producing oil, water, gas and some sand,” Mr Rivas explained. “But in the GOM, if we exceed a certain safe drawdown, the sand doesn’t come apart like snowfall in reverse, lifting off one grain at a time. It tends to fail catastrophically to when the well fails, everything – the tubing, the flowlines, even the separators – are full of sand. “The problem in the Gulf of Mexico is that no one has really been able to accurately predict how we can manage sand production,” he continued. “We don’t know how to determine how much sand will be produced and the particle size distribution. We are pretty good, as an industry, in forecasting the reservoir pressures and drawdown at which the sand will come apart, but we don’t know the other critical parameters, like the rate of sand production and whether the sand will come apart in a nice controlled manner or all at once. The big downside to sand management is that it can restrict the well production rate and thus jeopardize profitability, Mr Rivas said. Sand-control options range from frac packs to high-rate water or gravel packs and screens. 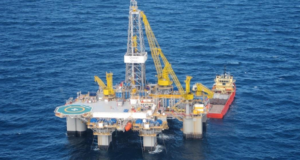 In the GOM, frac packs are generally considered to be the best sand-control completion option. 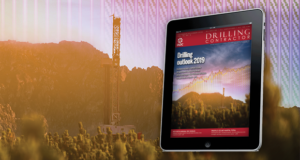 “Frac packs deliver a very reliable and efficient completion in the sense that there is very little pressure drop across the completion, and they have a low skin value, risking little damage to the wellbore,” Mr Rivas said. 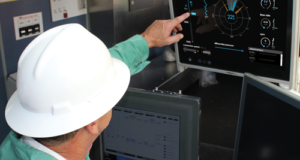 Frac packs may be more expensive, but their mean time to failure is longer than high-rate water packs or gravel packs or for stand-alone screens. Above, looking up at the frac head on the Cajun Express, which Chevron used to conduct a well test in the GOM. Gravel packs can be viable in shallow waters or mature areas where reserves are smaller and production rates lower, and don’t justify the cost of bringing in expensive frac equipment. 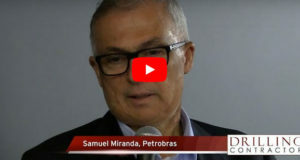 “These are completions that are short-lived, need minimal treatment to protect the facility from sand, and don’t have to optimize every single barrel because the economics don’t justify it,” Mr Rivas emphasized. Gravel packs and screens also may be selected in parts of world where frac pack vessels are not available. 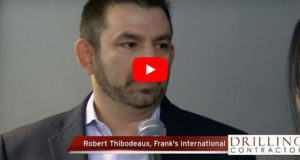 “It is very tough to pump a frac pack, with all the chemical additives and crosslink gels, without a big, built-for-purpose frac vessel that can roll up to the platform and hook up to the well to do the stimulation,” Mr Rivas noted. 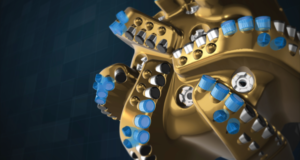 As the industry continues to delve into deeper waters, it is continually faced with technology gaps that necessitate ongoing development of new technological alternatives and tools. Among those is a resin treatment, suited for low reserve and shelf areas, that involves cleaning the grains and gluing them so that they bond together. 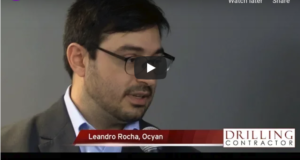 “This method, which is a replacement for a frac or gravel pack, is limited by the thickness of the interval, but it doesn’t require a frac vessel, is low cost and cuts permeability,” Mr Rivas explained. 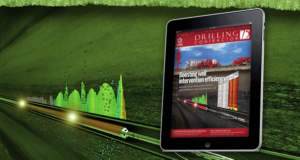 Another emerging technology addresses what the industry calls fines mobility, a subset of sand control that occurs when bits of shale and silt, or fines, that form in highly compressed and pressurized sand formations become mobile as the drawdown is put on the well to allow production. 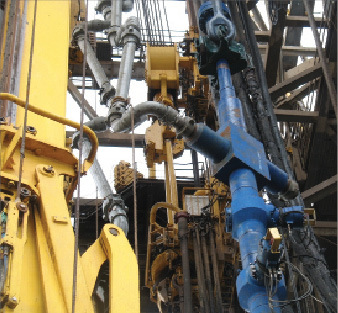 Frac packs can help in this situation because they control the flux, but there are some techniques, in the form of additives, that are being developed to make the fines stick to the proppant or sand, but out away from the wellbore so they don’t impede flow. The need for new and better screen designs and better ways to predict the effects of erosion have also become apparent. 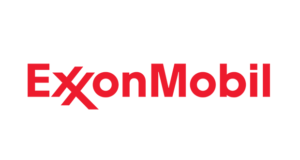 Chevron used Transocean’s dynamically positioned Cajun Express for an initial GOM well test in August 2004, then later to drill and complete subsequent GOM wells. producing areas with unconsolidated sands, it, along with other well design components, is being pushed to the limit as the industry is challenged by high costs, low permeability and marginal reserves in deeper waters. “In order to deliver the plan economically and reliably, we need to understand the cost/benefit relationship of every aspect of well construction, of which sand control is one of the big hitters that has an impact throughout the life of the well,” Mr Rivas emphasized.